If you're hunting for a fake, Bangkok is your one-stop-shop. For more than 30 years, this Bangkok mall has been known as a temple of shopping for designer fakes. We go shopping for shoes, bags, make-up and more, and see just what this counterfeit haven has to offer. Shopping in Bangkok is a limitless activity. From the glamorous, maze-like malls that congregate around Siam Station to the sprawling 15,000-stall Chatuchak Weekend Market, the largest in Asia, there is nothing you can’t buy in this city. But it’s the MBK Center that attracts the most spendthrift travellers; a mall where you can’t tell the difference between your Guccis and your Goccis – the shopping haven known as the temple of fakes. MBK shopping centre in Bangkok houses just about everything you could think of. I was here for a few reasons: my visiting brother-in-law was desperate for a pair of Kanye West’s Adidas Yeezy sneakers (desperate in an I’ll-only-pay-next-to-nothing-and-I-don’t-care-if-they’re-not-real kind of way), my partner was in the market for a new bluetooth speaker and I was keen to investigate the fake make-up I’d heard you could score from MBK at bargain prices. Opened in 1985 and once the largest mall in Asia, today, the recently renovated eight-level mall draws more than 150,000 shoppers a day for its plentiful supply of souvenirs, cheap clothes and high-end knock-offs. On the fashion floors – ground to third floor – shoes, bags and gold jewellery are the top sellers; convoys of tourists armed with empty suitcases roll from shop to shop, ready to pack their bags to their limits. 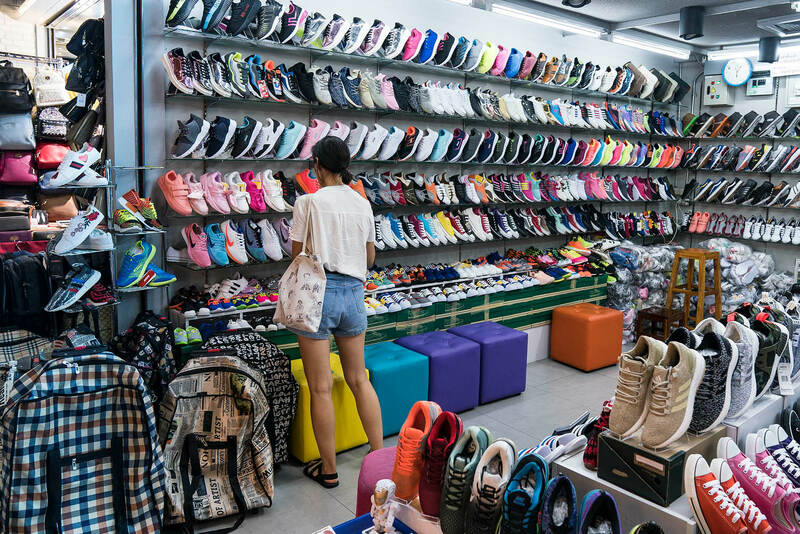 Here, the Yeezys are at every shoe store (2600 baht, about AUD$104, not cheap enough for my thrifty bro), as are a rainbow of fake Nike, Stan Smith and Converse sneakers. But next door, at the bag store, I’m a little perplexed. I’d read that the counterfeits in MBK are high-quality, but there were no big brands on show, just random labels I’d never heard of before. Searching through the likes of Coco London (curiously made in Bangkok) and Swiss Gear backpacks, the best brand I could find on the shelf was a black Michael Kors backpack, which the vendor dramatically proved was real leather by lighting a flame right on the fabric, and leaving no marks. As I walked around trying to find any more coveted labels, I noticed a European woman talking to a vendor in a shop with, again, only no-name brands. “Show me your Prada,” she asked the saleswoman, who unlocked a padlocked cupboard at the back of her store and pulled out what looked like a real-deal baby blue Prada Saffiano replica. The woman inspected it, and, seemingly pleased, paid the vendor 4,600 baht, about AUD$180 for a normally AUD$2,500 bag. Take your pick of a variety of products. It seems the decent fakes are harder to find these days, and you have to dig around to find the good stuff. Local online magazine BK magazine reported recently that Thai police seem to have a more frequent presence here, on the prowl every day checking shops and vendors. With the risk of four years jail time and fines of up to 400,000 baht (AUD$16,000) for selling inauthentic products, vendors have had to find less obvious ways to tout their counterfeit goods. But despite the high-ends becoming rarer, MBK is still a mecca for cheap, faux products. The beauty counters on level two, are stocked with lookalike MAC, Urban Decay and Nars eyeshadows, concealers and powders. I picked up one of Kylie Jenner’s famous lip kits, supposedly meant to give you a pillowy pout like hers. I asked the vendor if it was real, she smiled and shook her head. For 100 baht (AUD$4) for a lip gloss and liner worth 14 times that price, I was cool with that. I’d read beauty blogger warnings about grotesque allergic reactions to these fake glosses, but this guinea pig can report there were no elephant woman results; no plump Kylie lips either, unfortunately. Sick of buying into the Kardashian-West-Jenner empire, my partner drags us up to the fourth floor, the electronics floor. Here, lights flash, music blares, and refurbished phones, laptops, and all sorts of cables, cases and electronic thingamajigs are on offer. My partner, the gadget nerd, was in heaven. Me? Not so much. It’s here that the annoying hawker stereotypes come out. “Brother, take a look” and “hello madam, hello miss” stream like a non-stop chorus as we shuffle from stall to stall testing JBL portable bluetooth speakers, something my partner seemed to think we needed. After we found the one that looked the best (which, to me, looked like all the others), the vendor wanted 2000 baht, but it was an easy bargain down to 1500 baht (AUD$60 for a normally $229 speaker). More than 30 years since its opening, the MBK still provides a dizzying array of things to buy. Despite the higher-quality goods going more underground — if you want something, you’ll most likely find it here. So far our speaker has been working fine and projecting clearly. How long will it last? I’ll get back to you on that. Know before you go: What you see might not be all you can get. Bring a picture of what you’re after, and don’t be afraid to ask vendors if they know where to find it. The shop owners I encountered at MBK are friendly and honest, and will let you know what’s real and what’s fake, as well as the quality of the product. Bargain hard and buy in bulk: Never settle on the first price. 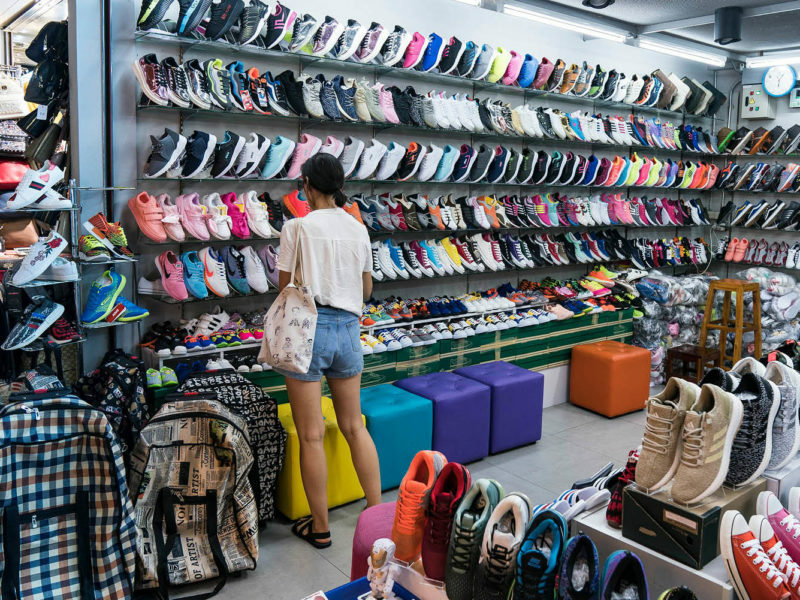 Some of the trendier items like the Yeezy shoes have a set price and vendors will refuse to go lower, but they’ll often be likely to knock a few baht off if you buy in bulk. Stock up on souvenirs for family and friends here, the more you buy, the bigger the discount. Talk like a native: If you speak a few words of Thai and wai (a Thai greeting where you press your palms together and bow slightly) to your vendor, they’ll instantly warm to you. This is the land of smiles, remember, and being congenial and respectful can go a long way. Sawadee (hello), paeng pai (too expensive) and khop khun (thank you), with ka (female) or krub (male) at the end of the word, are good phrases to remember.